New rock bands are a dime a dozen, but armed with a hard-edged sound that rips pages from several eras in rock history and a 'singer's singer' on vocals, Fighting Instinct bows with a record loaded with singles ready to rock the radio waves and scorch iPods. 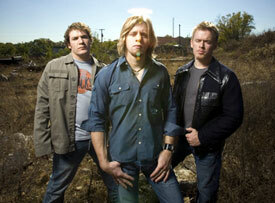 The band, hailing from North Carolina, combines Southern roots and melodic sensibilities with a modern rock edge. Among their influences: classic rockers like Zeppelin and Hendrix, Southern rockers Lynyrd Skynyrd, and modern bands like Soundgarden and Foo Fighters. Guitarist/vocalist T.J. Harris and drummer Dallas Farmer had played together for several years before they met up with Weekly in the Winston-Salem/Greensboro area. The trio scored a publishing deal with EMI that led to cutting some song demos in Memphis with producer Skidd Mills, who's resume includes killer projects for Saliva, Sister Hazel, and Skillet. Those demos so impressed the EMI suits that it turned into a full-blown record, done over a six-week period. "We had to do it quick. Football season was coming up," Harris says with a laugh. Bassist Jason Weekly came up with the band's name, which fits its message. "Everybody struggles everyday with who they are in relation to who they want to be. That's human nature-trying to be more than we are. We're not any different than anyone else. We have the same struggles, the same temptations, we fight the same things." The band describes their sound as Southern-flavored, soulful rock with intricate melodies. The band as a whole admires artists whose style and skill grows from album to album. "I appreciate the ones who've been though the ringer and come out on top, but it's nice to see the ones who've not taken the wrong road," says Harris. Reflecting on the modern rock scene, Weekly observes, "So many artists in the past seemed larger than life. I think today people want to see real people on stage. Before they wanted a fantasy life they couldn't attain," he says. "Now, they want something they can reach, something real." Real, huh? How about the band's inaugural single, the crushing "You Don't Know"? A great introduction to the band, it's a song about motives: "You don't know why I'm doing this," says Harris. "I'm not doing it for the money or fame-I'm doing it for the music, to bring something to the table that people can relate to, something that's not negative and that people can grab a hold of." It's representative of the over-all theme of the record, which he says is surrender-"finding our way back to what's gotten us here, and not losing sight of that. That can mean not losing sight of life, music, faith, whatever." "Back To You," another stand-out, is "about one of those 'grow-up' points in life," says Harris. Explains Weekly, "I think we all get to those points where you don't like what's going on, and you feel like you're going to go nuts if you don't change something." "Light My Way" is another, surfing a huge wave of crunchy guitars. The melodic relationship cut "Crush" was written by band friend Cody Smith. "I Found Forever," which shows the band's classic rock roots, was a collaboration with Mills, a love song they "rocked up pretty good," Harris says. "All Or Nothing" encourages the listener to go all out: "It's basically saying 'don't straddle the fence.' No matter what the subject-your faith, your job, your life in general-give it your all." That commitment is evident both on the record and in their searing live show. That's what Fighting Instinct brings to the table.